yet inspires creative interpretation. The trilogy, Three Muses, is a collection of portraits of individuals who have personally influenced the filmmaker, Nick Peterson, and represent various stages of the awareness and influence of art throughout a persons life. 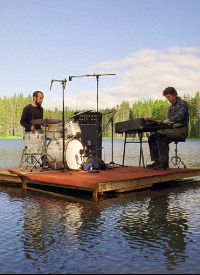 A laborious effort, from carrying over 90 pounds of film equipment across the treacherous snow-covered obsidian flows of Paulina Peak to the construction of a performance stage in the middle of Summit Lake atop Mt Hood, Muses was as much of a physical endurance trial as it was a collaborative feat of tenacity and vision. Nihon Kyuukei (9 Views of Japan) is a collection of landscape portraits shot over the course of a 3 week visit to Japan last summer. It sent Nick to remote and rural destinations in search of the distinctive relationship between Japan's scenic vistas and the character of it's people. atop Mt. Hood. Finally, "Mneme" (memory) follows 70 year old Eugene as his daily routine accidently intersects with the life of a stranger. This trilogy was funded in part by the Regional Arts & Culture Council. From the Kant prefecture in central Honshu to the Kyushu region in the south, this collection of landscape portraits was taken in Japan during the summer of 2012. Along the journey are such sights as the flowing rice fields of Kanagawa prefecture, the sounds of the deafening drone of cicadas off the shores of Karatsu and a gliding ferry ride to Yawatahama across the Uwa Sea. A profile of a stunningly beautiful country often typified by the bustling and crowded cities of Tokyo and Osaka, kyuukei is a quiet musing on rural Japan's more easily missed splendor. A short experiment inspired by Anton Webern's famed 1935 arrangement of a fugue for 6 voices from J.S. Bach's "Musical Offering". The film is built entirely of a succession of horizontal traveling shots which mimic Webern's acute mapping of different instruments to the same melody lines. Filmed in the summer of 2005 using a portable camera dolly designed and constructed by metal shop students at Franklin High School.